John Hagee’s predictions about the four blood moons are quickly being falsified– right before the eyes of the world! Is John Hagee Beginning to Hedge About the Four Blood Moons? Three of the four blood moons have now come and gone, and, nothing “huge,” nothing “earth shattering,”, nothing “world changing” has taken place as Hagee assured us that it would by now. The third Blood Moon on April 4, 2015 — and absolutely nothing happened to match any of Hagee’s dramatic predictions! Nothing!! It has to be remembered that John Hagee pointed the world to Joel 2:28f as proof for his predictions. After all, he assured us confidently, John said there would be signs in the sun and the MOON, before the Great Day of the Lord, and here we are (said he) about to see the four blood moons; signs in the moon! Of course, what Hagee failed to do was to honor what the Bible actually said about those signs of the end. In Acts 2, Peter– inspired by the Holy Spirit (which Hagee is NOT), quoted verbatim from Joel 2:28f as reference for the miraculous signs that were being manifested on that day, 2000 years ago. And Peter said of the signs being seen and heard that day: “This that which was spoken by the prophet Joel.” So, the issue here is that Peter said Joel was being fulfilled in his day, 2000 years ago. John Hagee claims that Joel is, without doubt, said he, going to be fulfilled right before our very eyes, no later than September 2015. And yet, let me repeat, not one thing that Hagee said would happen (in regard to the fulfillment of prophecy) has happened. Nothing even remotely resembling what Hagee needed to happen has happened! And it is amazing how quiet Hagee has been about the total lack of anything happening under the already occurring three blood moons. Total silence! Very revealing. The fact is that we are not in the last days. Peter’s words in Acts 2 settle that. Be sure to read the series of articles we are posting, written by David Curtis, #1 here – about the time of the end. And, be sure to order a copy of my book, The Last Days Identified, for a thorough examination of the doctrine of the Last Days. You will see– clearly and undeniably– that John Hagee and his predictions of the four blood moons, is false. 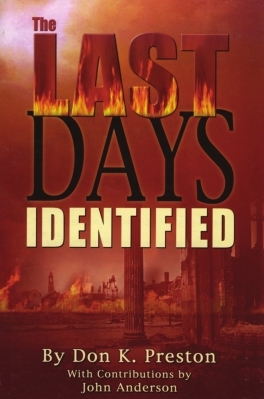 This book provides definitive proof that we are not in the last days, and that John Hagee’s predictions about the end are therefore false! 1. September 2015 will come and go, and the battle of Gog and Magog will not take place– as Hagee predicted it would. 2. Nothing “earth shattering” or “huge” as a sign of the end will occur. 3. I predict that even though nothing of huge, world wide, prophetic significance will occur, Hagee will nonetheless point to some event, somewhere, no matter how nebulous the significance of that event might be– and claim vindication for his claims. And lamentably, most of his followers will nod their head in approval, never thinking of how badly Hagee’s predictions have failed– over and over again. 4. Hagee may well simply ignore his past predictions, as if he never made them. And what is interesting is that in his latest mail out (April 7, 2015) Hagee said not one word about the passing of the first three blood moons and the fact that nothing has happened! Not a word! Instead, he discussed how incredibly popular the movie about the moons has been. He does not even discuss the fact that the final of the four blood moons is approaching in September! Not a word. Instead, after discussing the movie, he says “see you at the movies!” Not a word about looking up, and packing up, because we are going up! His silence in regard to the upcoming fourth and final blood moon is just amazing! 5. Hagee will go on record as saying “I never predicted the time of the end!” I never set the “day or the hour.” Of course, that is not the point! No one is saying that he predict the “day and the hour.” The point is that Hagee has predicted, vociferously, emphatically, and unambiguously, that “something big”, something “huge,” must happen– as a sign of the end, no later than September 2015. And, keep this in mind, three of those four blood moons have come and gone quietly, with nothing earth shattering taking place as a sign of the end! So, and I can’t believe I am saying this: “Keep looking up!” Come September, 2015, the final of the four blood moons will take place, and John Hagee will be exposed– once again– as a false prophet! Something big has happened and is still happenin. People are getting milked out of their hard earned money, just like the Catholic Church did in the 15th and 16th centuries!